Vermeil (22kt gold plated over sterling silver) French hooks with heart-shaped finials support charming bead work motifs in these earrings. I've needle woven 6mm crystal pearls with 3mm crystal beads to make lightweight and feminine earrings with a slightly Middle Eastern flavor. 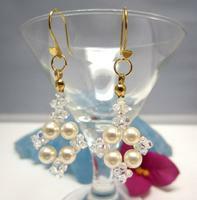 All the beads in these earrings are made by Swarovski Crystal. Each beaded earring dangles about 2-1/4" from top of the hook to the bottom of the motif. When only the very best will do, these beaded earrings from SPAKLE PLENTY fill the bill with style!